Some college friends of mine were working on a television pilot for a sketch comedy group called Wits' End. They needed a set and props designed for a game show sketch they were producing. 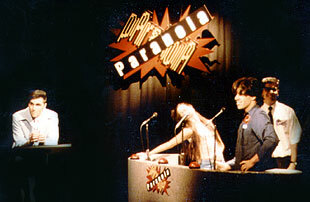 On a shoestring budget, I created the logo for the game show, "Paranoia," and some of the set props—signs, contestants' badges and buzzers. Along with helping the troupe set up the studio, I helped the director in the booth by being the floor director in the studio.